At the end of july I have my first solo exhibition. It is very exciting but also very scary. There is still so much to do! Inspired by the New Forest (and with the creative minds of children) I am creating a collection of artwork that brings children’s drawings to life. Using a combination of knitted and stitched fabrics, each child’s drawing is reproduced in fine detail to retain it’s childish character and imaginatively bring it to life. The textile artwork of children’s drawings illustrates the story that i have been writing for the last couple of months about a bird flying through the forest and the friends he meets on his journey. Without Children this exhibition won’t be possible. I am looking for children of all ages to help with this project and draw pictures of animals that live in the forest. I want any animals! If you would like to get involved please email me on laura@lauralong.co.uk and I will send you the details. ps. 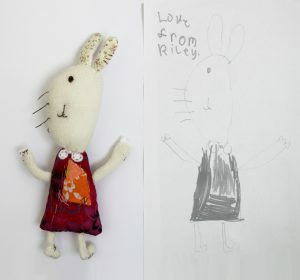 My cousins daughter is the artist behind the Riley rabbit.